Since we have a better living condition than we had before, many favorite hobbies of us are easy to become true. Playing music is one of the most favors all over the world. Many people who want to play a music song with a piano, but they can afford an expensive instrument. Do not worry about this issue! We are here to bring you a great solution! In the last article, we showed you some of the proper digital pianos for you like the Casio CPD 135 and the Yamaha P45. To give you a more affordable selection of a musical instrument, we are going to give you one more product. 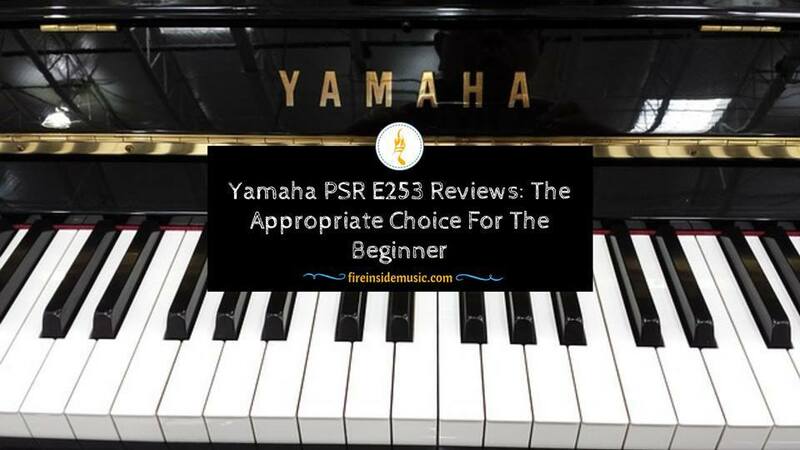 Read Yamaha PSR E253 Review Before Buying! Final: Yamaha PSR E253 is OKAY? First of all, we need to take a closer look at the specification of the product. Afterward, we will give you about what people using this keyboard think of this one. Therefore, you can gain an overall view of the Yamaha PSR E253. Let’s see what features a Yamaha PSR E253 has in this content. It has a lot of features coming along with. The product includes many loaded instrument “voices” as well as different drum and sound effects. That means we can have truly good musical enjoining experiences with this digital piano. The outside design and the onboard features are perfect for the beginner. We are sure that you will have a lot of easiness in learning at the first time. The Yamaha PSR E253 is a small digital piano of the Yamaha PSR series. The keyboard of it has 65 note keys. It is not a lot of keys for an advanced performance but really suitable for the beginner. On the keyboard’s surface, the manufacturer installed an LCD display in the middle. We can control the way of playing music and sound effects by press the buttons and knobs. In addition, there are two speakers mounted on the top of both sides, they are 12cm, 2,5W. The screen in the center of the keyboard shows the user which selection in use. For instance, it applies both bass and treble clefs for you to learn the note. Moreover, we can know exactly which note being used on the left part of the screen. Moreover, there are a lot of buttons going on the upside of the keyboard. The reason for the complexion of buttons is that this device includes a lot of onboard features. Therefore, we will get various buttons on the surface of the keyboard. The manufacturer organized the patches into groups such as piano, guitar, drum kits, and organ. The player can recognize the groups of a patch through the marks above the LCD panel. For example, you can choose the drum symbols for choosing the drum patch. ​The key to this product is well-made one. They come in sleek and shiny looks. Those keys are so soft for the user to enjoin the smooth movement while playing music. We can tap the key quickly and softly due to the perfection in design. According to the manufacturer, the digital keyboard includes the AWM tone generation method (which is the Advanced Wave Memory). The method is an essential sample play-back engine for offering up to 32 voices of polyphony. Moreover, the device has 372 loaded instrument “voices” as well as 13 different drum and sound effects. For example, we can choose a lot of tone effect from the drum (cymbal, tom, kick, snare, etc.) Plus, it can supply a few effects to fit your performances. They are the Reverb, the Chorus, the Ultra-Wide stereo, and the Master EQ. The Yamaha PSR E253 features the onboard sound system. The system is great for creating a clear and soft sound as you are playing. The built-in speaker also contributes to the good sound effects. This product has the Aux Line Input technology. The input technic combine with a headphone output allows the user to connect with various music devices. For example, we can create a fluent connection between the Yamaha PSR E253 and an MP3 player, a mixer, a computer or the other digital piano. Therefore, you can play your favorite music songs in the other device through this internal speaker. As you can see, the product has a lightweight design, unlike the run-of-the-mill real piano. The weight of it is only about nine pounds. Therefore, you can bring it everywhere to practice playing or share the music with your friends. The Yamaha PSR E253 has the dimension of 94 x 10.6 x 31.7 cm (H x W x D). Therefore, the portability of this product is perfect for moving around. The product can use batteries (six AAA batteries) as sources of power. On the other hand, you can use the 6W AC adapter to use the direct electricity from the dock. There is a detachable rest coming with the product. This separated part is good for you to put the device on for the higher location. On the whole, we found a lot of good feedback for the Yamaha PSR E253 from many users. To go deeper into the detailed information, you should keep reading until the end of the content. As we mentioned above, you can see clearly that the appearance of the product is quite delicate. It is a perfect-sized and lightweight device for easy portability. The design of the keys, control panel, and speakers is appropriate. The keys have are large enough for satisfying bounce-back effects. Moreover, when reading the manual instruction carefully, we can use this digital piano with ease. The elegant also expresses through the key design. At first glance, we can see that the key is so sleek and shiny. The reason why the Yamaha PSR E253 is perfect for the one who starts to play music is not only for the function but also for the price. In this content, we will go deeper into the first reason. The second reason is in the below content. First of all, the design of the keys on the keyboard is excellent. They are so light for the fingertips to touch them. When playing music with light keys, we can learn the form in a more effective way. We need to practice usually for the better result. In addition, there is a tiny symbol on the surface of each key. Those symbols represent the drum and effect sounds which are available onboard. As we mentioned above, there are a lot of functions into a tiny device. The Yamaha brand makes those symbols for better in triggering that sound. The drum and effects sound of the Yamaha PSR E253 is written in standard chord shorthand. This is great for a greener to identify all the types of chords at the beginning. Remember which symbol represents what drum or effects kinds, and you can combine them while playing. Moreover, the beginner needs to explore the cluster of buttons on the left of the screen. Those buttons include three-style-playing lessons which are “listen and learn,” timing as well as waiting. As your first time learning how to play the piano, the lesson is really useful to help you improve your skills. You can control the song playback with the four buttons. In other words, we can choose the accompaniment, various parts as well as pause and play the music song. A tempo tap works to adjust the tempo of the song. Last but not least, there are a lot of other functional buttons for you to make your song lively or to improve the playing skills like a demo button, a metronome, and a phrase recorder. As the product has less functional features than the professional instrumental, it is appropriate for practicing use. You can purchase this one as a practical device for your music lessons. We are sure that the digital piano is perfect for the amateur purpose. Besides, it can also use in advanced situations, but you may get some inconveniences. Although the keyboard of the Yamaha PSR E253 is not as good as the real mechanic piano, the full-sized keys are in a great size. People say that they are satisfied with the resistance and bounce-back of them. At first, the control panels on the surface of this piano are not good in the organization. On the other hand, we can understand the confusion after reading through the manual instructions. The reason for the complexion is that this device includes a lot of onboard features. Therefore, we will get various buttons on the surface of the keyboard. Here are some frequent questions about this product. You may find some same wonders while operating this device. Can I use the device to play classical music? Yes, you can. With this Yamaha PSR E253, you can not only play classical music but also the other music types like country music, pop music, and rock music. How about the nine-step lesson function of this device? This is a special lesson for the beginner. The lesson includes nine stages of learning which are three lessons for the left hand, three lessons for the right hand as well as three lessons for both hands. During the practicing process, the scoring function will bring fun experiences for the learner. Moreover, the waiting function onboard supports the improvement of tapping keys as the right tempo. Can I use the AC adapter to run the digital piano as a power connection? Yes, you can. But you have to buy an AC power adapter separately. The digital piano does not come with the adapter in the product box. Therefore, if you want to use your electric household source, you need to purchase an AC power adapter. Moreover, you can also use triple AAA batteries as a power source. Is there any holder to hold up the sheet music? Yes, it has. You can find a stand coming with the main device on the box. Can you explain for me about the weighted keys? It describes the work of those keys of this keyboard in physic. They work like a traditional piano when you play. They do not respond to the manner when you tap the key like the touch-sensitive one. It’s time for us to come to the end of this Yamaha PSR E253 Review. This seems to be a lot of things over here, but they are the useful information for you in finding a good musical instrument. As all the information we showed you in this article, we can say that the product is totally suitable for the beginner. 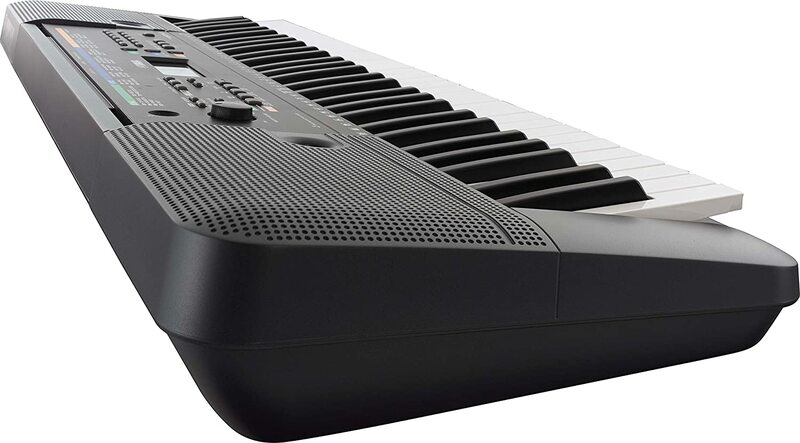 The Yamaha PSR E253 is one of the Yamaha low-cost keyboard series which remain almost the best features of entry-level one. Although the keyboard can work as well as the professional one, it is a budget-friendly one for practicing and starting to learn music. Trust us, and you will never regret your selection.